After the interview, there are additional opportunities to give a lasting impression. It is important to realize that when you walk out of the interview room, you still hold the responsibility to show the company why you would be an asset to their team. 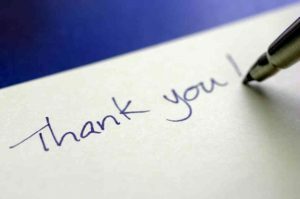 Write a thank you note. A handwritten note may seem to be a thing of the past, but it should be the first thing you do after leaving an interview. Sending a handwritten thank you note within 24 hours of your interview leaves a positive lasting impression. The note should simply thank the interviewer for their time and the opportunity to interview with their company. Follow up. Following up after an interview will do many things. First, it will allow you to see where the company is in the decision process and answer any outstanding questions they may still have. Second, it will show the company that you are still interested in the position and willing to make the effort to obtain it. A follow-up phone call to your interviewer should be considered around one week after your interview if you have not heard from the company. However, having a clear idea of the timeline for the decision process when you leave the interview will better allow you to time your follow up. Continue to research. Even though your interview is over, the company you interviewed with is most likely winning deals, launching campaigns and signing contracts. It is important to keep up to date on your prospective employer and any business decisions that may be happening. If the company has any big developments, it is a great time to send a congratulatory message, which serves as a reminder of your interest in the company. Keep your word. When leaving an interview, there is a chance the interviewer may ask you to complete something within a certain time frame. For example, your interviewer may ask you to send in your references within 24 hours, or complete an online assessment by next week. It is important to remember the time frame given to you and complete whatever is necessary as soon as possible and within the requested time frame. Be patient. All companies move at different speeds. Some will give you feedback before you walk out of the door while others will take more time gathering their thoughts. If you haven’t heard back from the company a few days after the interview, do not assume that they do not think you are the best candidate. Instead, stay positive and follow up one week later.